Pearl Ex Powdered Pigments are our most versatile product yet! Mix Pearl Ex into any viscous medium for a metallic/pearlescent effect. Pearl Ex is a safe, inert pigment that exhibits extreme colorfastness and stability, ideal for interior, fashion, fine arts and other archival applications. It has a use for every artist, from watercolorist to auto painter, faux finisher to rubber stamper. Try it mixed with Jacquard Gum Arabic or Pearl Ex Varnish for applying to most surfaces. It can also be mixed with other artist mediums, oils, acrylics, encaustic, Dorland’s Wax, polymer clays, or spread dry on porous surfaces. Pearl Ex creates a metallic look without being a metal–it will not tarnish or fade. The different particle sizes produce different effects, from a smooth pearly luster, to a highly metallic sheen. The smallest is Micropearl at 5-25 microns. The largest is Super Copper and Macropearl at 60-200 microns. The rest average between 20-60 microns. 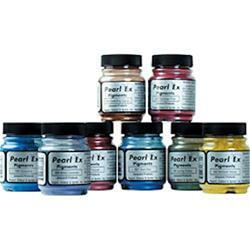 Mix Into: •Pearl Ex Varnish •Oil •Acrylic •Gouache •Varnish •Clay •Melted wax •Almost any medium! Apply to: •Clay •Glass •Metal •Wood •Paper •Fabric •Almost anything! Pearl Ex creates a metallic look without being a metal. The particles are flat platelets with two surfaces, therefore it lays down beautifully like a thin coating of metal. The different particle sizes produce different looks—from a fine, smooth, pearly luster to a highly metallic sheen. It is a safe, non-toxic, inert powdered pigment with a neutral pH. It is extremely color fast and stable—it will not tarnish or fade and is therefore ideal for archival applications.